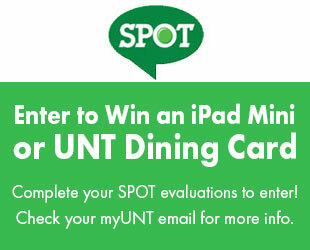 Denton is known for its arts scene, but it is not something found on the Square or the walls of the art building at UNT. It can also be found 13 miles down the road from Denton. 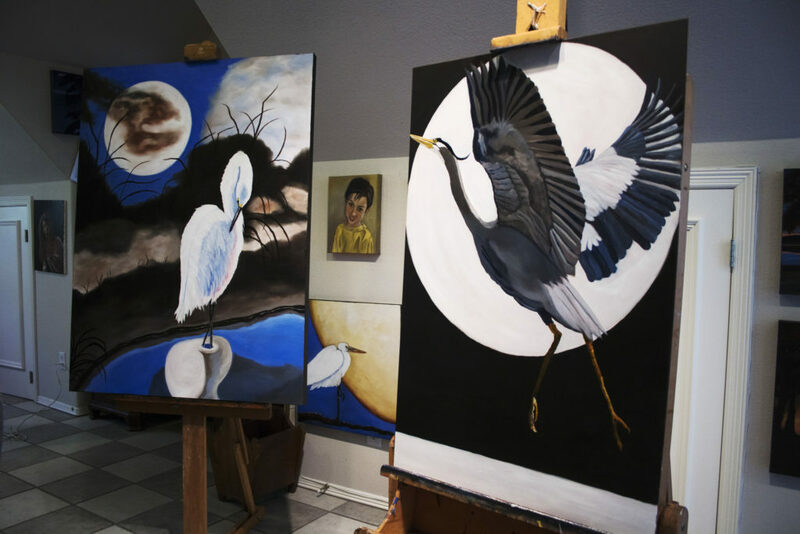 The Cross Timbers Artist’s Guild is a group of different artists living in Flower Mound, Highland Village, Lewisville and the surrounding areas. The guild was created in 2002, with 23 artists participating this year. Every year the guild holds a tour where members of the group open up their studios to the public so the community can see their art and learn more about what they do. Each member of the tour has their own story of why they are passionate about their art. For Melodee Martin-Ramirez, happy memories of art go all the way back to her childhood. She remembers opening up a fresh box of 64-count Crayola crayons from her grandmother and coloring with her mother. She also remembers learning the basics of her creative passion from her fifth grade art teacher. Each memory has created the happy place of art that Martin-Ramirez has spent most of her life in. Her love for art was what pushed her to get her bachelor’s degree at UNT, majoring in education with a double minor in art and psychology. 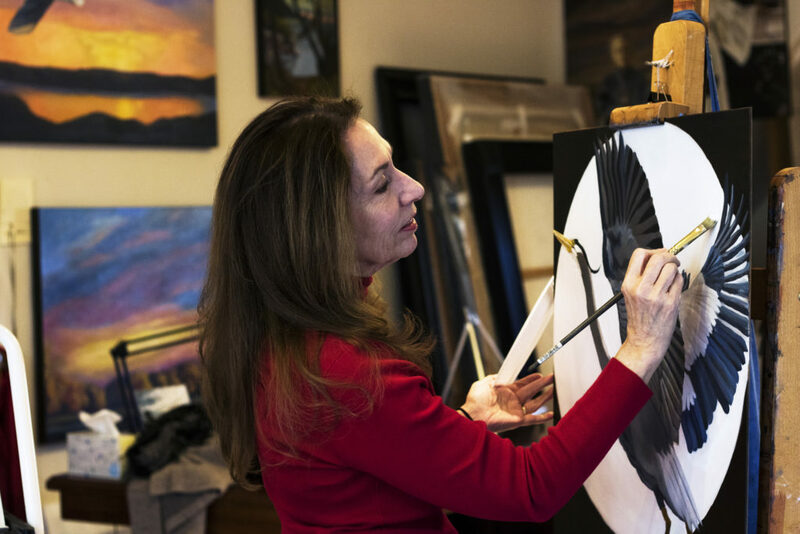 She ended up earning three master’s degrees in art after graduating in 1976. Now she works as a professor at North Lake College. Her passion to share art with others inspired her to help found the Cross Timbers Artist’s Guild Studio Tour in 2002. She saw her friend and fellow artist Marty Ray do a tour in White Rock, so Martin-Ramirez and some of the other founding members created the guild. It has been 17 years since Martin-Ramirez helped found the studio tour, and she is proud of the progress it has made. She has even contributed her paintings to this year’s studio tour. Holding the leftover blue and green paint, that is exactly what House did. The freedom House found at her grandparents’ home when she was a little girl led her to become an abstract painter. House did not take her first art class until she was a senior in high school. 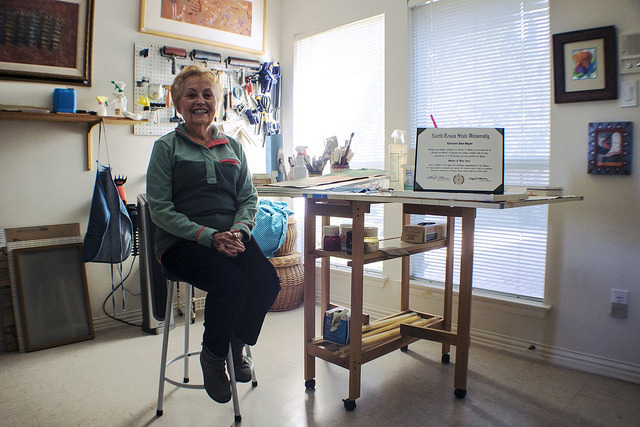 After graduating from Kansas State University in 1973, she moved to Texas and later earned her master’s degree in art education at Texas Woman’s University. House also took a couple classes at UNT during that time. In 2002, House was part of the founding group that created the Cross Timbers Artist’s Guild. As an artist and educator, House agreed it was important to help bring the idea from the East Dallas area to her community. It was 1965 and 10 years had passed since Lorraine Hayes took her first oil painting class in high school. It was much longer since her earliest memory as a child, drawing the horses in the pasture by her house. Her passion for art had always been a part of her but was put on hold after high school until that moment. At 29 years old, Hayes was reminded of her desire to create art and eventually applied to UNT, which was called North Texas State College at the time, to get an MFA in printmaking. 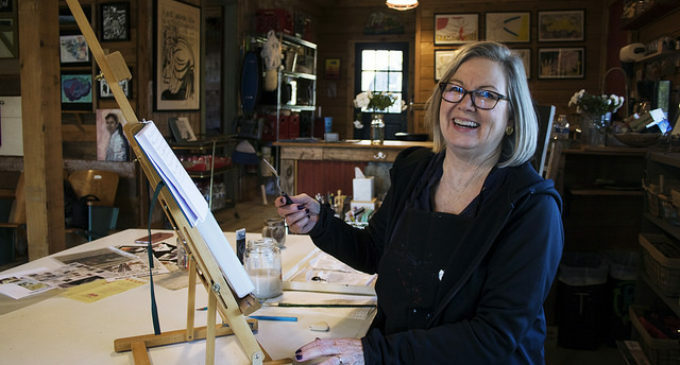 When Hayes moved to Highland Village with her husband to be closer to her grandchildren, her desire to be in community with other artists led her to join the Cross Timbers Artist’s Guild in 2003. Now at 82 years old, she has learned the skills to become the artist she has wanted to be since a little girl. Thank you Rachel and Paige. Enjoyed meeting you and love this article.